Translator into Ladino of the prayers composed by Malachi ben Jacob on the occasion of the earthquake at Leghorn, in January, 1742, under the title "Traduccion de la Oracion del Ajuno de los Temblores de Tierra que en Ladino Español Illustro," Pisa, 1746. He lived in Italy during the middle of the eighteenth century. An Alonzo de Bargas of Palma (in Majorca of the Balearic islands) was burned in the auto da fé held in Seville Feb. 24, 1722. The name "Bargas" may possibly be connected with the city Barga in the Italian province of Lucca. Allgem. 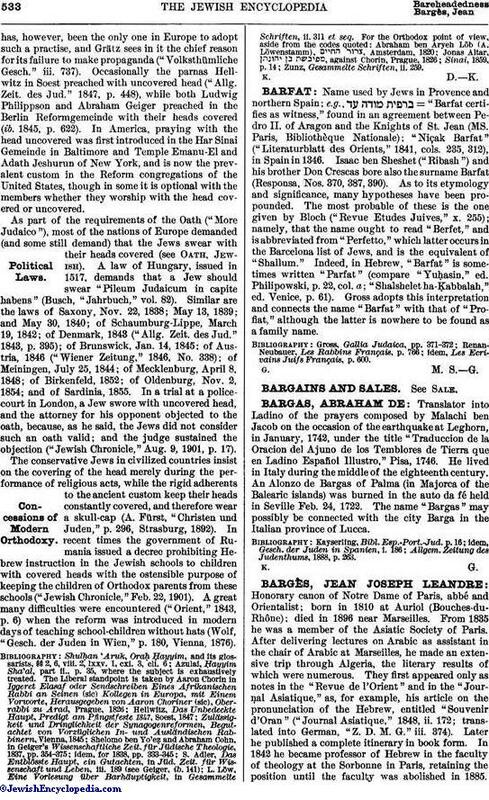 Zeitung des Judenthums, 1888, p. 263.